Edusphere is a 4 layered learning methodology which empowers distance education. Edusphere is a capsule surrounding your distance education program to transform it into an outcome based education with world class learning experience. In-short Edusphere converts your distance degree into a valued career asset. Traditional distance education has its own limitation of only imparting education without much focus given to the flexibility and convenience to students and deep void of industry acceptance. There is neither arrangement for progress check nor student hand-holding and in most cases there is no contact between the institute & the student. It lacks focused holistic learning approach to make students industry ready. This led to huge gap between academia and industry. 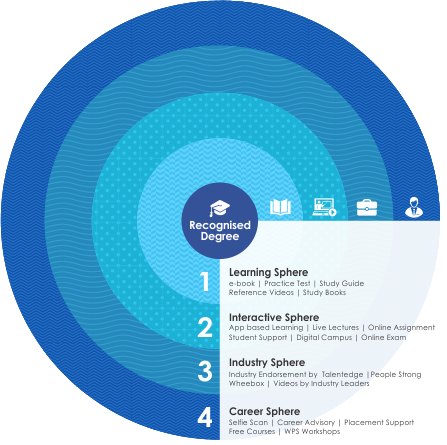 Edusphere- a 4-layered learning methodology empowers the distance degree to make it in to valued career asset. As we know planet earth is surrounded by atmosphere, which is made up of layers like troposphere, stratosphere and so on. Each layer plays a vital role to nourish, nurture and protect to make life grow on earth. Edusphere encapsulates distance education to add career driven values for students, which help students to earn a distance degree which enables them to overcome the void of distance education in comparison to campus based education. Edusphere empowers the students with flexibility and quality to complete their higher education without compromising their professional career and personal life. Thus giving the students a true career valued asset for their professional growth.